Including full breakfast and complimentary water and pop. 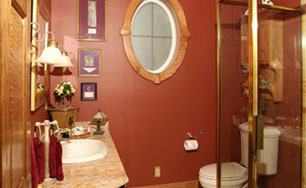 Some rooms feature in suite Jacuzzis; all with private bathrooms. We have added to the kitchen a brand new Avanti Wine Chiller that houses bottles of wine from our local wineries for complimentary sampling. Guests are also able to chill their own bottles with the use of our "guest labels". For our guests who are antique lovers and shoppers we have now made available the use of our nearly 250 reference books, a number of them out-of-print valuable guides. A large mahogany hand carved book case has been added to our parlor to house the reference books. North Coast Inland Trail This wonderful bike trail has now completed its previously unfinished path through the city of Bellevue, and the bike path runs right in front of the Victorian Tudor Inn. For years we have welcomed the bikers with special breakfast requests and secured locked storage for their bicycles in our large two story garage. Now we are just seconds from the official path! 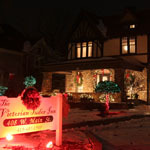 419.483.5522 For your special flowers and gifts contact this local business, a few blocks from the Inn. Your flowers and items will be wonderfully designed to your request and be in your suite when you check-in. This is a family owned business with a great reputation. We serve breakfast available with made-from-scratch Belgium Waffles, French Toast (including the optional "stuffed" French Toast) made from wonderfully flavored breads from local bakeries, and Omelets along with fresh fruit, local bacon, fresh ground - fresh brewed coffee, a large selection of teas, premium orange juice, whole grain breads and locally baked treats. Feel free to make special requests. 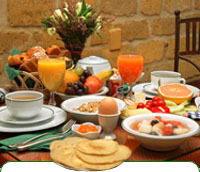 Breakfast will be served from 7 a.m. to 10 a.m. Other times can be arranged upon request. Your breakfast will be served fresh at the time you select- so please be prompt! Today's travelers are spending smarter and desiring a unique experience. I assure my guests of a high level of comfort in an historical setting with modern amenities (flat screen TVs, wireless internet, sufficient electrical outlets, etc.) Along with premium bedding, spa robes/towels, early check–in/late check–out, superb breakfasts – at a time of your choosing and many complimentary items (wine, soda pop, snacks, etc.). Jun 2017 My sisters and I stayed here for our annual Sisters Weekend and it was fantastic. 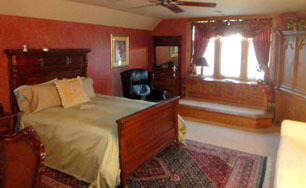 The accommodations were perfect for us and the host was just outstanding. Mar 2017 Large suite, was upgraded by management to suite with Jacuzzi. 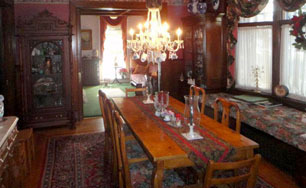 Did not eat meals so cannot comment but service good and the interior of this 100+ yr old home is to be seen. Mar 2017 we carefully selected The Victorian Tudor Inn based on their reviews and what they offered and our previous stay years ago. . We were not at all disappointed. The Inn is BEAUTIFUL, very unique with special appointments, especially the antiques and furniture; unlike any B & B we have stayed at. 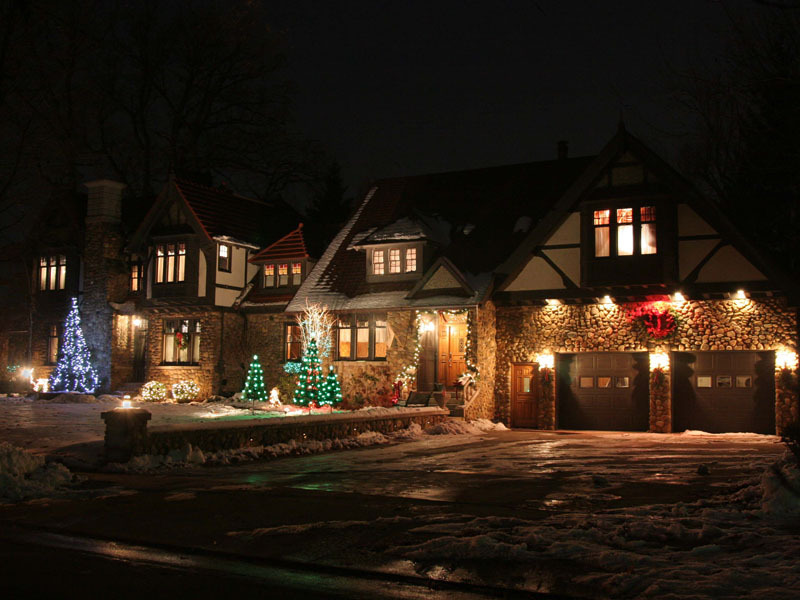 This home, "… the prettiest in the city" (Bellevue Gazette, 1908), was designed by the famous Fremont, Ohio architect, S. H. Shively, for Newton and Moina Greenslade. The Greenslades were prominent business and civic leaders, and board member's of the city's First National Bank, a present day thriving bank. The Bellevue Greenslades were not only banking entrepreneurs, but also military leaders, such as Admiral John W. Greenslade, who held various crucial WW II appointments, including Commandant of the Navy's Twelfth Naval District. 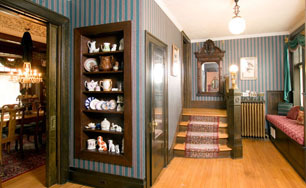 The house is located in the prestigious and historical W. Main St. of Bellevue, Ohio, founded in 1815. Bellevue has the unique fame of being the home to Henry Flagler and Stephen Harkness. It was in Bellevue these two industrialists met John D. Rockefeller, a salesmen at that time. This relationship led to the founding of the Standard Oil Company as well as various railroads. Bellevue is located in the north central Vacationland area of Ohio. 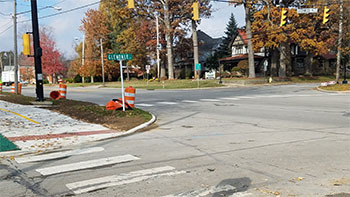 It's convenient location is approximately an hour from either Toledo or Cleveland and minutes from the Lake Erie shore including Sandusky, the Cedar Point Amusement Park and major indoor water parks. 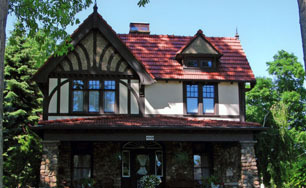 Its location provides a plethora of opportunities to antique, visit surrounding specialty shops, taverns, and unique restaurants. Wonderful museums and historical attractions dot the surrounding community, including Bellevue's Mad River and NKP Railroad Museum and Lyme Village. 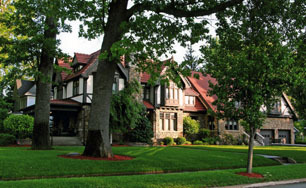 Additionally just minutes away is the Rutherford B. Hayes Presidential Center, the seven building Milan Historical Museum, the Merry–Go–Round Museum, Thomas Edison's boyhood home, and the Fostoria and Tiffin Glass Museums, just to name a few (refer to the "Area Activities and Attractions" page for more listings). 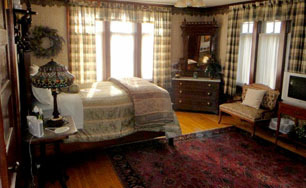 The Victorian Tudor Inn is in a wonderful location to experience day trips to most of Northern and Central Ohio. 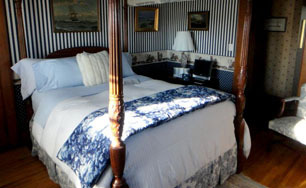 Guests can rest comfortably in our relaxed elegance in a safe community. Start off your day with our invigorating, fresh and healthy breakfast as you embark to the Amish country, or the nationally recognized Toledo Museum of Art, or the Rock and Roll Hall of Fame in Cleveland, or even a sailing venture on Lake Erie (see our "Special Packages" page). Wherever your day's outing may go, you can return and rest on The Victorian Tudor Inn's spacious porch, surrounded by 70" towering Oak Trees in the front yard, enjoying our continuous special refreshments. 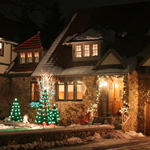 Bellevue is fortunate to have five full–service locally owned restaurants, all within minutes of the Inn. They include an Italian, a German, a Mexican, a Steak/Fish Sports Bar and our wonderful local golf course dining room. All but one also have bar/cocktail areas. Our Inn features five bedrooms in four suites, all appointed with genuine period antiques, hand woven oriental carpets, Victorian era and other fine furniture and each with a private bath. 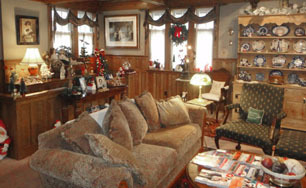 Your host has traveled across the country and internationally for nearly thirty years amassing a wonderful array of antiques for you to enjoy (refer to "About Your Innkeeper" page). 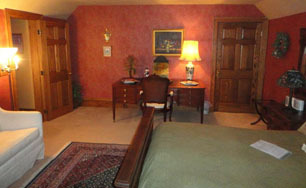 Additionally, our Inn provides several public areas. 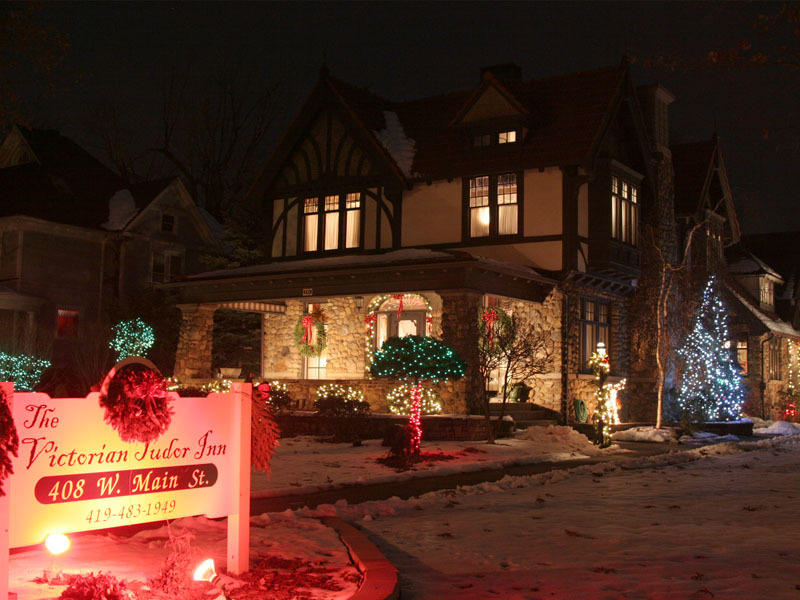 The Victorian Tudor Inn, while quite beautiful, is not a museum, and your host wants you to take pleasure in its offerings and functionally use and appreciate what it has to offer. Antique china, fine silver and sterling, and beautiful glass is used through out the day by our guests. 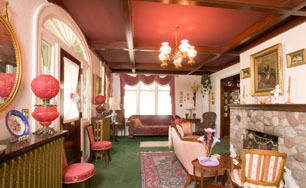 Please refer to our "Amenities" page for a thorough listing of what The Victorian Tudor Inn provides you. 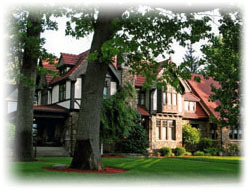 Our family has resided in Bellevue and north central Ohio for over a century. 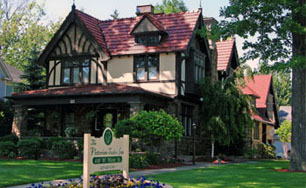 The Victorian Tudor Inn is a family run bed and breakfast, and you, as our guest, become part of our family. It is our desire to have you return often to your "home away from home". Our vast knowledge in our community and surrounding towns and cities will be invaluable in helping you design your trips and fulfill your needs and desires. We will provide you with first class concierge service, including maps and the inside "scoop" about our area that only the locals know. We make every attempt to accommodate your requests and to even anticipate them before you know you know them (for example, providing complimentary postage for all your post cards; maybe even for The Victorian Tudor Inn's postcard that you want to mail to family and friends! ).